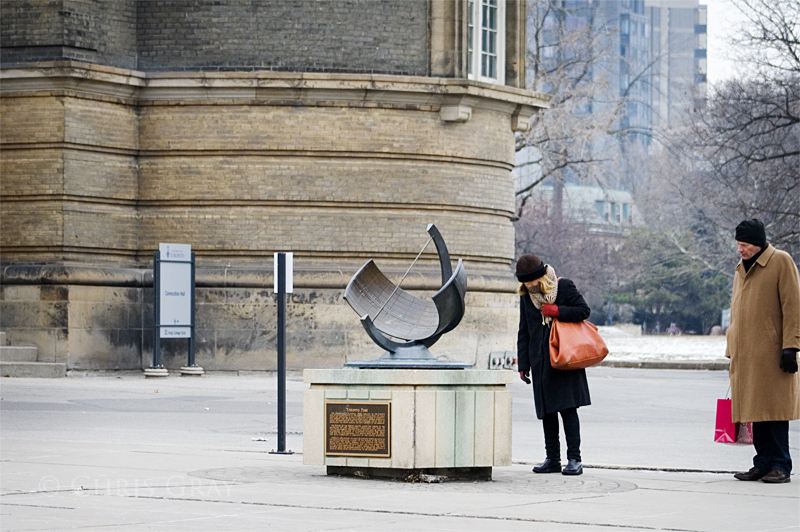 On the campus of University of Toronto, this sculpture sits exactly on the Toronto Meridian, and points towards the Magnetic North Pole. Apparently, this was the official designation of Toronto until 1908, according to the plaque under the sculpture. Magnetic north was almost coincident with true north in 1840, but by 1898 it had drifted westward by 5 degrees. This sculpture commemorates the designation, and shows how long the Univeristy of Toronto has been around. Stopping to grab a quick bite before heading off to complete their Christmas shopping, no doubt. 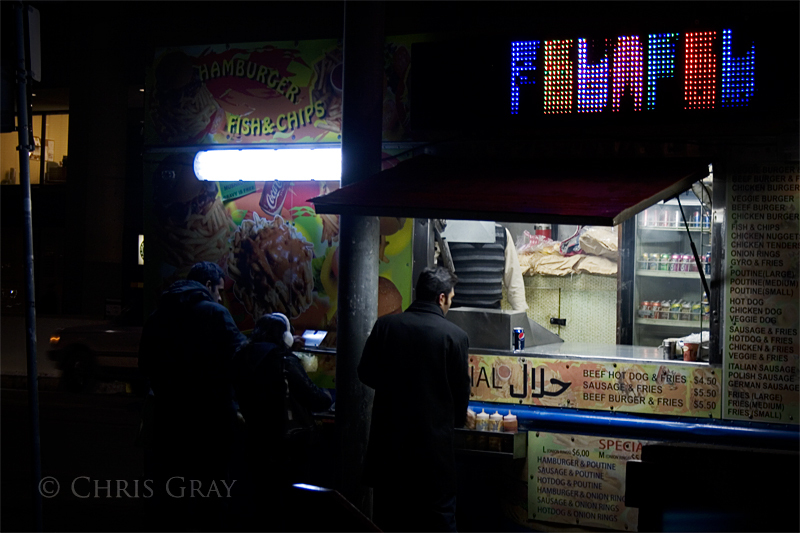 I love that the city now allows more choices than hot dogs, sausages and such at city food carts. I wish they'd administer the program a little better, and allow even more choices, but it's a good beginning. 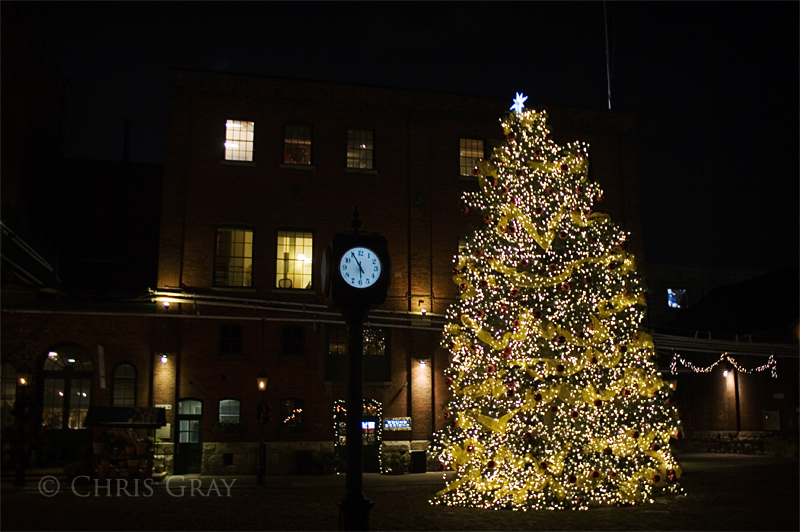 They really go all out for Christmas down in the Distillery. This tree is huge, and I don't even want to think about how many lights there are on it. It was cold when the aliens landed - their vehicles were large, and found their way into the city. Their appearance provoked cries of awe and terror that quickly faded to annoyance, as the glacial pace made them more road hazard than invading force. In fact, some of the vehicles stood in place long enough that buildings were erected around them, turning them into art pieces like this one. 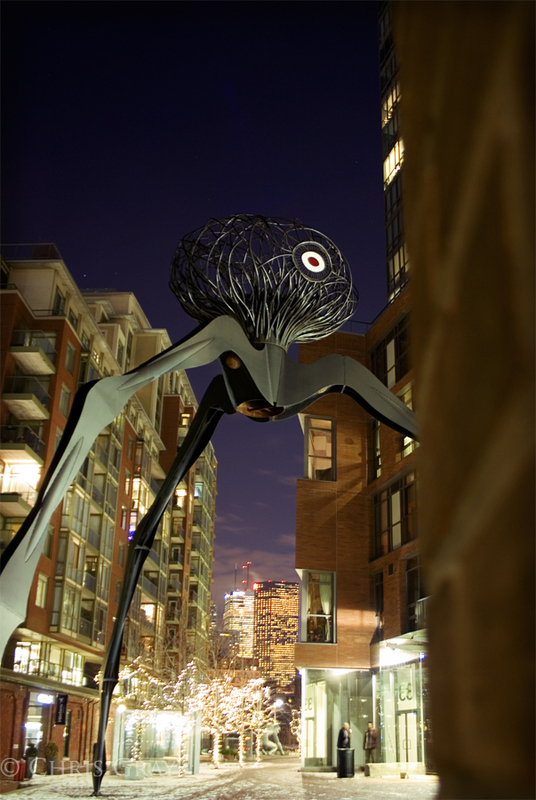 Seriously, though, this is a really neat sculpture down in the Toronto Distillery district. I went down to Pikto to pick up some prints for my daughter, and had to take a shot of this. Of course, with no tripod, or monopod, I had to improvise for the 2 1/2 second exposure. Walls are handy, though, so I managed to get a pretty good shot. 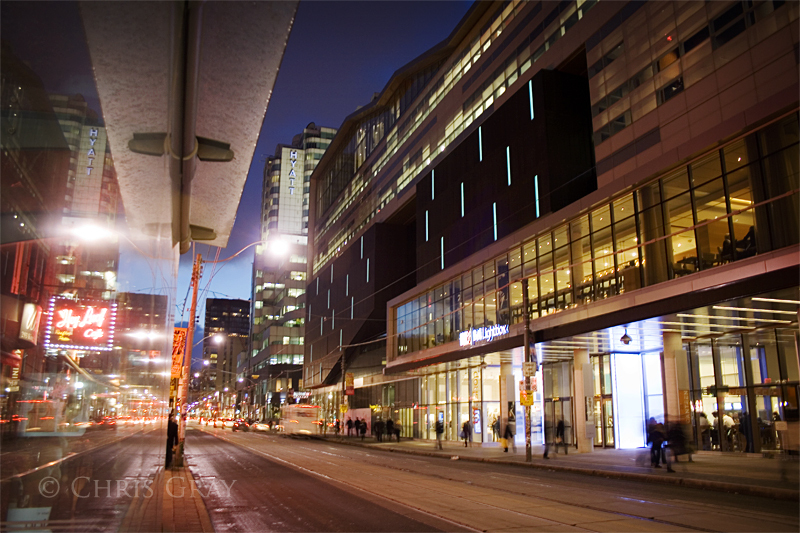 Nothing says Bay Street like tall buildings lining each side of the street. 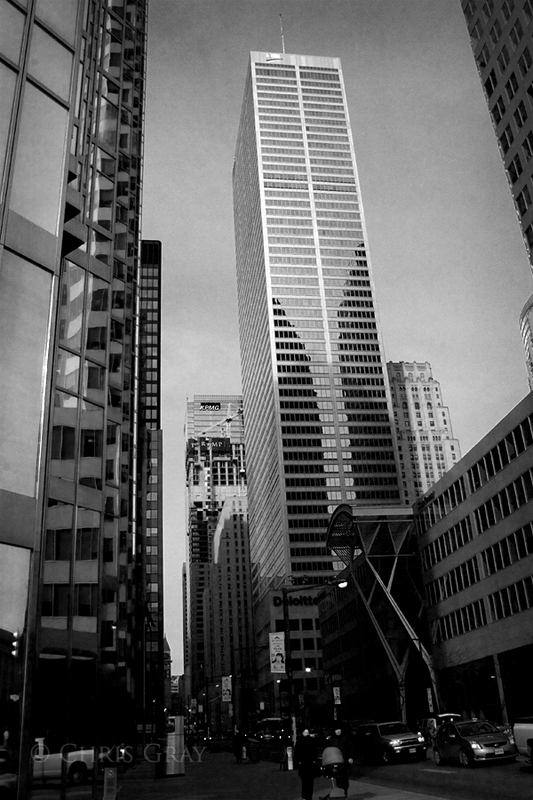 However, the tall buildings have the wonderful effect of channeling the wind rather spectacularly. Just after taking this picture, my new hat was blown right off my head, and I ended up chasing it across 4 lanes of traffic. Lesson learned - when it's windy, and you want to take pictures - leave the hat at home.